WILKINS, LEWIS MORRIS, lawyer, militia officer, office holder, politician, and judge; b. c. 1768 in Morrisania (New York City), N.Y., son of the Reverend Isaac Wilkins and Isabella Morris, sister of Lewis Morris, one of the signers of the American Declaration of Independence; m. 13 Aug. 1799 Sarah Creighton, daughter of John Creighton*, in Lunenburg, N.S., and they had seven children, including Lewis Morris* and Martin Isaac*; d. 3 Jan. 1848 at the family home in Windsor, N.S. The father of Lewis Morris Wilkins was a New York loyalist who brought his family to Shelburne, N.S., in 1784. Details about the education of Lewis Morris are lacking. He may have studied law with his uncle Martin S., a Shelburne attorney, and he was admitted to the Nova Scotian bar about 1798. Commissioned lieutenant in the Lunenburg County militia on 6 July 1793, two years later he received a small grant in Lunenburg Township. Wilkins’s political career began in 1799 with his election to the House of Assembly from Lunenburg Township, a district he represented for his entire career in the legislature. At the beginning of the 1806 session William Cottnam Tonge* was chosen speaker, but Lieutenant Governor Sir John Wentworth* was on bad terms with Tonge and rejected him. After debating Wentworth’s action, unprecedented in Nova Scotia, for two days, the members elected Wilkins on 20 November. Wentworth approved of the less controversial Wilkins and after the session reported to Lord Castlereagh, the colonial secretary, that Wilkins had “performed the dutys of his situation during the Sessions with impartiality, diligence and decorum.” Notwithstanding this praise, Wilkins collided with the lieutenant governor that session over an election in Annapolis Township which had been declared void by the assembly. Wentworth and the Council refused to issue new writs, claiming that the assembly had not the exclusive right to determine contested elections, and only after the English law officers had upheld the assembly’s claim did Wentworth issue the writs to Wilkins. The assembly was relatively peaceful for the next few years, but there were instances of discord. In 1809 Wilkins was prominent in opposing the decision of Administrator Alexander Croke to veto the appropriations bill, and in 1812 he led the assembly in condemning the Council’s decision to modify a money bill. Besides acting as leader of the assembly, Wilkins corresponded with speakers in other colonies and with the agent of the assembly in London. He was also one of the commissioners for the expenditure in furnishing Government House and sat on the committee to plan the interior of Province House. On 30 March 1816 Wilkins was elevated to the bench as third assistant judge in the Supreme Court, and he resigned from the assembly the following February. Soon after his appointment he moved to Windsor, where he became known for the lavish hospitality with which he welcomed visitors such as his intimate friend William Edward Parry*, the Arctic navigator, and Lieutenant Governor Lord Dalhousie [Ramsay]. 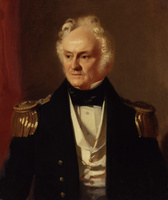 Whether because of the demands of Wilkins’s social position or those of his large family, by the late 1820s his fellow judge James Stewart commented that Wilkins was “very poor.” Stewart added that Wilkins was continually trying to have the judges’ salaries increased, and that he disagreed with nearly everyone because his financial difficulties made him want to show his independence. He was certainly less than polite in the court-room. At the September sessions of 1829 in Pictou he was so rude to a plaintiff that he was rebuked by the latter’s lawyer, James William Johnston*. Wilkins’s duties undoubtedly weighed on him. In 1816 the system of circuit courts hitherto in operation in certain counties was extended to the entire province. The journeys required of the two judges necessary to hold a court were long and arduous, and as Wilkins grew older he became less able to undertake them. No doubt for this reason, he tried for several years to have the law changed to allow one judge to hold court. When he succeeded in 1834 he rejoiced, since the younger judges would be able to perform the majority of the duties. In 1838 Wilkins was granted leave of absence to go to England for the recovery of his health. His “bodily infirmities” apparently prevented him from travelling on circuit again, although in 1839 and 1845 he attended court at Horton and Kentville respectively. On his death the barristers of the province eulogized him as “one of the most popular, eloquent and effective Advocates . . . distinguished . . . as the ‘Poor man’s Friend.’” His will left all his property to his wife and eldest son. PANS, MG 1, 979–80; RG 1, 303–5; RG 5, A, 6–22; R, 1; RG 39, HX, C, 78–88; J, 14–22, 102; KI, J, 5. N.S., House of Assembly, Journal and proc., 1800–17, 1834–36. Reports of cases, argued and determined in the Court of Vice-Admiralty, at Halifax, in Nova-Scotia, from . . . 1803, to the end of the year 1813 . . . , comp. James Stewart (London, 1814). Reports of cases argued and determined in the Supreme Court of Nova Scotia . . . , comp. 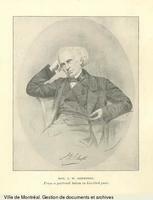 James Thomson (Halifax), 2, pt.i (1856). Acadian Recorder, 8 Jan. 1848. Novascotian, 10 Jan. 1848. Royal Gazette and the Nova-Scotia Advertiser, 20 Aug. 1799. A calendar of official correspondence and legislative papers, Nova Scotia, 1802–15, comp. Margaret Ells (Halifax, 1936). Beck, Government of N.S. Cuthbertson, Old attorney general. J. G. Marshall, A brief history of public proceedings and events, legal, – parliamentary, – and miscellaneous, in the province of Nova Scotia, during the earliest years of the present century (Halifax, [1878?]). Murdoch, Hist. of N.S., vol.3. C. J. Townshend, History of the Court of Chancery in Nova Scotia (Toronto, 1900). Margaret Ells, “Governor Wentworth’s patronage,” N.S. Hist. Soc., Coll., 25 (1942): 49–73. Phyllis R. Blakeley, “WILKINS, LEWIS MORRIS (d. 1848),” in Dictionary of Canadian Biography, vol. 7, University of Toronto/Université Laval, 2003–, accessed April 20, 2019, http://www.biographi.ca/en/bio/wilkins_lewis_morris_1848_7E.html.